Home / Blog / How to Make Form Submissions Secure on an API Website . Implementing forms on a Vue.js website? Having a readonly website is a piece of cake. Easy to develop using headless CMS, easy to maintain, and zero worries about security. 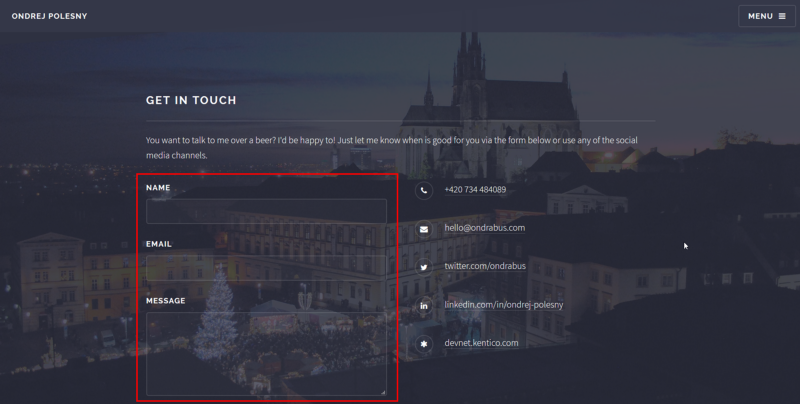 But, what if you want to have a contact form on your site? Where are you going to store the form submissions? How are you going to protect it from bots and other forms of misuse? When collecting data from website visitors, you may be required to comply with GDPR. If that is the case, make sure to collect visitors’ consent for processing the data and store the data in GDPR compliant service. In this article I will be showing all the steps on my personal site like in the previous articles. I don’t want to overwhelm visitors with too many fields, as that reduces the probability of them actually submitting the message. Therefore the form is very simple, but all fields are required. Alright, the form is defined, contains all fields, but what is the action URL? What is the target of the form? This is where the fun starts! We will use an external service to store all data from submitted forms. So far we’ve used headless CMS Kentico Cloud as an external service to feed our websites with content. However, headless CMS is not designed to store form submissions. Its purpose is to maintain content and deliver it to various channels, in our case a website. Form submissions always contain private data that will never end up being published on the site. If you do more research, you are likely to find others. I chose Form.io for one particular reason — it’s free for 1000 submissions per month. 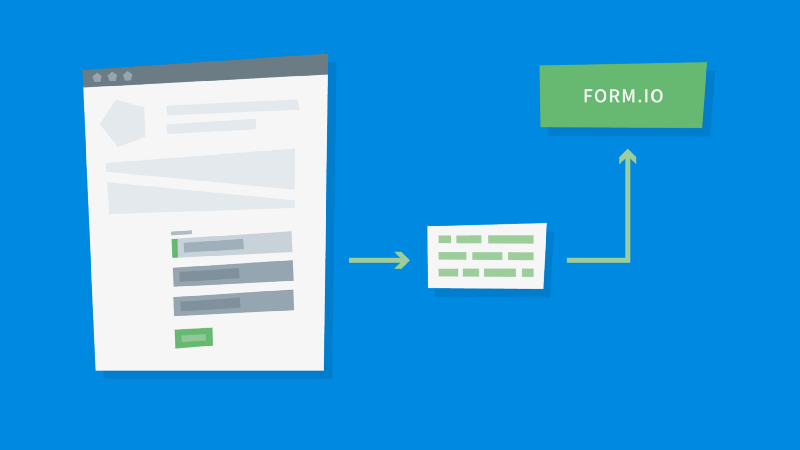 After a quick registration the administration interface let’s you create form definitions. This defines fields to store data from submissions. In my case I just followed the list I composed earlier and defined fields for name, email and message. To make the whole process of submitting data to this form easy, switch to Access tab and enable Anonymous access via API. Anonymous API access sounds a bit insecure, right? Well, in order to post data to your Form.io form, even anonymously, you need to know the API Path. Therefore as long as you keep the API Path a secret, you have nothing to worry about. I will explain later why the anonymous access is easier here. The form is defined, form submissions storage selected, let’s put it all together! Well, not yet. It is possible to wire up the contact form I presented earlier with Form.io form directly, but that would make it very vulnerable. Why? Anyone would be able to repeat posting the contact form indefinitely. That would have a negative effect on the website’s availability. Also, the free plan of Form.io includes only certain number of API calls which would be quickly exceeded. And can you imagine what a nightmare it would be to separate SPAM submissions from real ones? Therefore we need to secure the form. In the past I’ve always used reCaptcha control from Google. I’m sure you’ve seen it in action on many websites. You tick a box, wait a moment and you are free to submit the form. Of course we need to validate this process on the server too. Otherwise any person submitting the form could just repeat the outgoing HTTP request to the form’s endpoint regardless if you have reCaptcha or not. To make this validation you need a service that lets you process a bit of code. I decided to use Webtask.io as it is — yet again — free. But you can just as easily leverage for example Azure Functions (check out this great article about Azure Functions by Bryan Soltis). The server function on Webtask.io will check if the submission has data for all required fields and will also validate submitted reCaptcha code. If there are any issues it will respond back with an appropriate message. Otherwise it would send the data to Form.io API directly. Does the last schema look like a lot of work? That is the beauty of microservices architecture. It may look complicated, but when you see the actual code, it is very short, clean, and easy to understand. Putting this all together took me just few hours including all sign-ups and figuring out the API specifics as I did not have previous experience with Webtask.io or Form.io. Have you noticed the bus variable? Good job! The whole form is a Vue.js component and as such it handles all functionality around itself. That includes data submissions, form rendering and so on. Therefore we need to tell the component that reCaptcha is initialized and form can be submitted. Simple way how to do it is using events in Vue.js. We just need to create one dedicated instance of Vue.js for this purpose. I added it to the beginning of components.js file as it is the first one in order. Let’s stay in the components.js file for now and see the implementation of the Form component. The data function now contains several new properties. There is a property for each of the form fields (name, email, message), array for error messages (errors) and three status fields (formGood, disabled, sending). Properties of form fields are bound to respective inputs using v-model attribute. The status property formGood will ensure that the Thank you message is displayed when the form is successfully submitted. Property sending will present a simple overlay above the form while the form submission is being processed. And finally the disabled property will ensure that the form can not be submitted before reCaptcha is initialized. Remember the recaptchaLoaded function? The one that emits the event recaptchaLoaded when reCaptcha is initialized. The created function of form component will listen for this event. 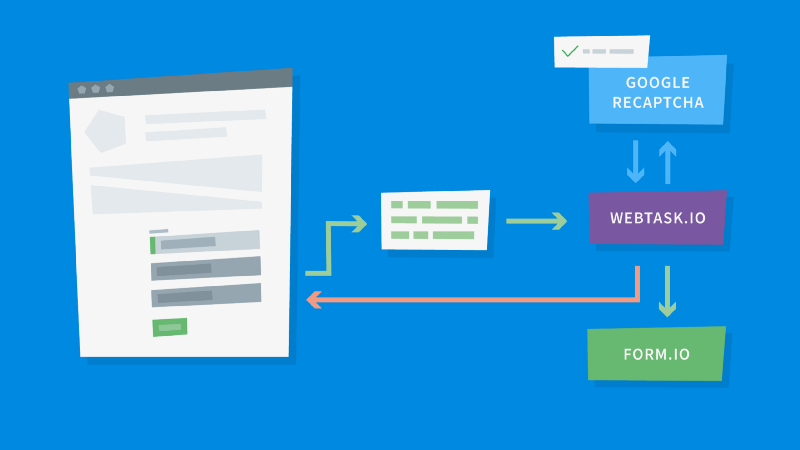 The created function is executed when the Form component is created. That occurs long before reCaptcha gets initialized so when that happens, form is already waiting for the event and subsequently invokes the enable method which in turn enables the Submit button through disabled property. The response to the submit request is again in JSON format. After parsing it and checking the status, there are 2 possibilities. Either the submission was successful and form data were forwarded to Form.io, or there are some issues. In that case the errors are copied into local dataset and displayed to the visitor by Vue.js. At the end of processing the submission we may reset the sending flag so that the overlay is again hidden. The body that contains the form fields data in JSON is available in context.body property. 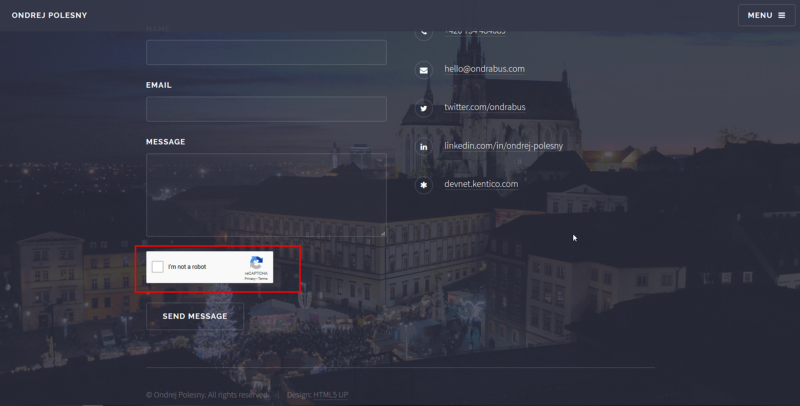 In function checkForm we check the form’s required fields and validate reCaptcha. If the request validates, the data are submitted to Form.io using sendToFormIo function, otherwise we respond with error messages and status. If you do it the same way, you can reference this value using context.secrets.recaptcha in the function’s implementation. In the last part of Webtask.io function you see that I am basically forwarding the same message to Form.io API. Remember the anonymous access that I suggested you enable on Form.io form? That is what enables me to post the message directly to the Form.io API. Otherwise I would have to adjust the function’s implementation to first obtain jwt-token in authentication request and send the form data in another authenticated request. Because the communication between Webtask.io and Form.io is private and API path is kept a secret, there is no need to worry about authentication here. Note that near the response processing logic there is a console.log(resp). In case something goes wrong and the request can not be processed because of failure in the communication between services, the actual response with error codes and description would be stored in log using console.log and can be investigated later in Webtask.io administration interface. In this part I got inspiration for my implementation in a great article by Raymond Camden on his blog. Once you have it all implemented, go ahead and give it a test run. After the first successful form submission you will see form data in Form.io form under the Data tab. You will see that it is easy to wire services together and create a website that just works and treats sensitive data in a secure way. You don’t need to babysit any huge solution running on an expensive hosting plan, or worse, on a rented virtual server.